Options are a great way to add diversification and an alternative income stream to your portfolio, but the strategy can often be confusing for some investors. Between calls, puts and strikes, it’s easy to get lost in the terminology. Frank Maeba is one of the portfolio managers at Neuberger Berman Breton Hill ULC who runs Purpose Premium Yield Fund (PYF). The portfolio uses a specific options strategy known as cash-covered put writing where puts are sold to other investors to earn a premium. We spoke to Frank about how the strategy works and why it’s a powerful tool every investor should consider. Q: First off, what’s the difference between selling calls and selling puts? When you sell a call, someone on the other side of the options contract has the right to buy stock from you at a higher price. When you’re selling a put, the person who owns that put has the right to sell stock to you at a lower price. That’s the main difference. Selling a put means you could end up buying stock. As a seller of calls, I could end up being short stock. Q: How can investors use puts in their portfolios? Probably the number one way to use a put as an investor is really to protect your portfolio from going down. If you’re long equities or long certain stock names and you’re worried that there are bad things happening in the world or that the market is topping out, and you want to protect against that kind of downside, you can pay a premium – basically a type of insurance that protects you against that stock decline. So, you’ll have the right to sell that stock at a pre-defined level, even if it’s trading significantly lower. 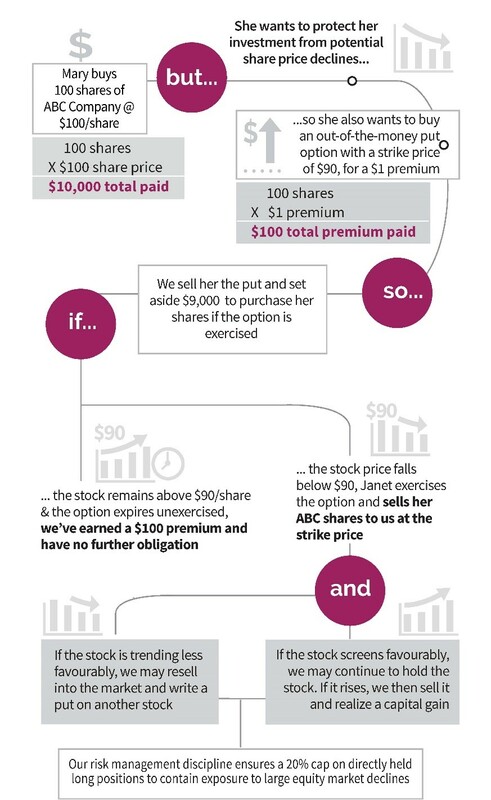 Q: How exactly does a put act as insurance for your stocks? There are two sides of puts. Investors who are worried about a downward move generally will pay up for insurance to protect their portfolio [by giving them the right to sell stocks at a certain price even if they decline]. On the flip side, there are people who sell that insurance and they try to collect those premiums. They try to collect as many premiums as possible because over a long cycle in general, collecting premiums is a pretty healthy business. Once every year or every couple of months, you might get impacted by a bad event where you have to pay out on that insurance claim, so to speak. Over a longer cycle, there are many businesses predicated on collecting those insurance premiums. The way we set up our own current portfolio in PYF is similar to that. We’re selling insurance or put premiums, collecting those premiums and generating a healthy yield. And hopefully we can risk manage the portfolio so we don’t really have a bad event happen across the portfolio. Q: Is selling puts essentially applying the insurance business model to an investment portfolio? That’s exactly it! You’re picking up small premiums. Think of it as earning maybe a dollar a month selling puts. Hopefully you can string together a lot of positive months where you collect a dollar every month for 11 months, and then on the final month something bad might happen. You’ve collected hopefully 11 dollars in premiums, and then you might actually have to pay out half of it to cover some bad event. But net-net over the course of the year, you get to keep more than you pay out. And that’s the gist of this strategy and of the insurance business. Q: Insurance companies sometimes pay out huge amounts, yet they manage to operate in a fairly stable manner. Does selling puts add stability to your portfolio? It’s a pretty consistent way of generating an income in yield that’s pretty diversified versus just owning dividend equities or fixed-income credit. It gives a very different risk profile that can be stable over time. When you’re dealing with options there can be two key things that help make it more of a steady ride. First of all, it’s experience. At Neuberger, we’ve had a lot of experience managing these types of option portfolios going back decades. There are certain things you can do to help manage the risks of this kind of strategy so that when it does draw down and you have to pay out that insurance, maybe it’s not as deep a payout as you might expect. The second thing for managing risk is just doing it consistently over time, diversifying the names of the portfolio and trying not to use too much leverage. [PYF] is an unlevered type strategy. These are the kinds of things that help minimize the risks of a big blow up. Q: How much time and work have you personally put in to learning how to run an options strategy? I started off my career on an options desk back in the mid-1990s. So, I have over 20 years of options experience. It’s across multiple markets: not only equities, but currencies, commodities, rates. All derivatives markets have certain basic construction blocks, so to speak. So, getting really good at currencies, for me, definitely applies over in equities or even fixed income and commodities. I’d say there’s multiple learnings across a cycle. Over the last 20 years, we’ve seen ups and downs in markets; we’ve seen geopolitical events; good things and bad things happening in the [options investing] instruments. All of those learnings are really embedded in the current strategy to make it as smooth as possible. In terms of the effort, there are two things I’d say. A lot of that experience helps us run the portfolio in a very efficient and cost-efficient way. The second thing is that we’ve built a substantial amount of technology around our options trading so that it can scale in a reasonable way to minimize trading costs and expenses. And also, [technology helps] just to manage the sheer number of options we’re trading each and every month. The options market is still one of those markets that’s not as automated as equities or currencies. There’s still a lot of manual stuff in order to execute an options trade. So, we’ve built out quite a bit of technology to help us do that in a very efficient manner. Q: What exactly are you looking for when you decide to execute an options trade? First and foremost, it’s not really the derivative we’re looking at, especially in PYF. We start off with “are these stocks that we want to ultimately own?” The way to think about a lot of this strategy is you sell a put, you earn a premium, and if you happen to get put to, meaning exercised, and you end up owning that stock, that’s not necessarily a bad thing. Another way to think about it is that you’re earning a premium while waiting to potentially own that stock at a lower price. Once we identify that group of stocks, we do a secondary screen where we look at “do these have attractive volatility or option characterizes that we think are worth writing puts on?” The things in the secondary part of that process would be “do they exhibit high volatility?” That usually means they pay a higher premium, so you get to harvest that higher premium on that name. Probably the biggest thing in running this type of program is that the names have to be highly liquid. We tend to really only write puts in the US market because it has the deepest options liquidity. In order to manage an ETF-mutual fund complex doing this type of strategy where there’s inflows and outflows, trading back and forth, you want very tight bid-offer spreads. And you want that kind of liquidity to manage the underlying instruments. Q: How big of a role should this type of strategy play in an overall portfolio? I think alternatives are definitely a very important part of any type of traditional asset mix; especially right now, with markets where they are. Bonds are probably at their all-time low yields and yields will likely rise going forward. Equities are at extremely high levels; potentially, on a valuation basis, at the top-end of the range. And we’re late in the economic cycle. So, that traditional 60/40 asset mix – you can’t really rely on it, I would think, to produce the same kinds of returns we’ve seen over the last decade going forward. Really, the trick is finding what the alternative return drivers are. What are alternative-type risk profiles that I can put into my portfolio that can potentially give me the returns I’m used to but also mitigate the downside risks of equities selling off heavily or bonds selling off heavily? I think this type of product meets a lot of those desires. If you’re trying to generate income in your portfolio and you’ve relied on credit, bonds or dividend-paying equities – those are all suffering right now with rates backing up. Whereas this type of product has a negative beta to interest rates. It actually performs well when interest rates are going up. It does have underlying equities that we write puts on, but these puts are 7-10% out of the money. And, it has much less direct exposure to markets than the alternative of just owning the long-only equity outright. The way we manage this strategy, it only has on average 10-15% exposure to the underlying equities. Significantly less beta is being held in this portfolio, but still pumping out a pretty healthy income distribution of 5-7%. Q: What’s the worst-case scenario with this strategy? Worst-case scenario is that you’ve written a lot of puts that are 7-10% out of money and then all of a sudden, the market just drops. We’ve seen examples of that across history. Think of the crash in 1987 where basically the market just dumped 20% in a straight line. That’s not great for this type of portfolio. Even in February, we saw a straight line drop where the markets fell 12% from the peak in quick order. That’s when these risk-management techniques come into play and are tested. One of the biggest things we do is diversify the number of names that we write on, but we also diversify the types of puts. We will choose different maturities on the puts and different strikes. So, diversify as much as possible. The whole point of diversification in this type of derivative portfolio is to smooth out the path dependency of the overall portfolio. The more diversification you can embed in it, the more that risk is diffused across the entire portfolio. Since inception, the overall volatility of this portfolio has only been 3.5%. Equities normally exhibit anywhere from 15-20% volatility over a cycle, bonds anywhere from 4-5% volatility. The volatility of this portfolio is substantially less over a cycle so far. In February 2018, PYF actually ended up on the month slightly. A lot of the risk-management techniques we’ve discussed about diversification, those are a lot of the reasons why it was able to dampen that impact despite February being [the kind of event] that can damage an options portfolio. We saw a lot of options portfolios blow up, but we were able to skate by relatively easy. It goes to show we construct these portfolios, we hand-hold them, we focus on managing risk around them, and that’s embedded in everything that we do. Inception of PYF is January 19, 2016; data as at May 31, 2018.